Everyone hates the perfume section. Come on, don’t lie, all those scents make it really difficult to figure out whether that amazing cologne you’re smelling is actually amazing, or just remnants of the incredibly perfumed air. So how do you find the best cologne for young men? We’ve assembled a handy guide to help you know what to look for without hitting the perfume section. Here are some things to look for when picking out an amazing cologne. Eau de Toilette: Eau de Toilette is a fancy way of saying this cologne is ready to wear. Pure colognes need to be diluted in order to be wearable without being overbearing, eau de toilette means that process is already done, just spray and go. Fragrance Type: This icon will tell you what the overwhelming scent of the fragrance is. This can range from wood to citrus, so keep an eye out for something that smells great to you or whoever you’re buying for. Spray: Sprays make it easier to apply the cologne, so keep this in mind when choosing a product. A spray bottle can make the whole process easier, especially for people who apply cologne before their morning coffee. Use: Is this more of a daytime or nighttime scent? Will it last all day, all night, or will it get you through both? Keep an eye on this icon to answer these questions. 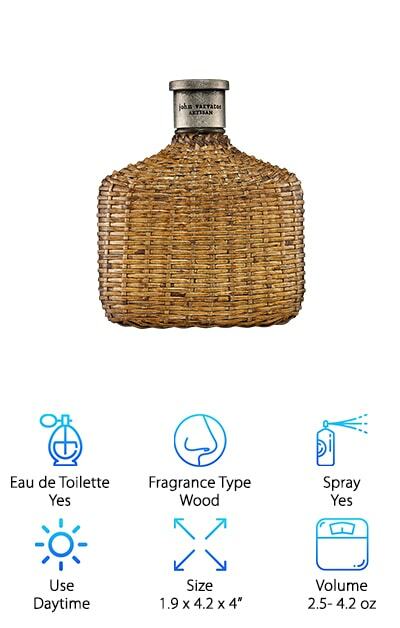 Size: If this cologne is going on an already cluttered bathroom countertop, size is an important thing to keep in mind. Although, larger bottles typically hold more cologne, so if you’re looking to stock up this may not be a problem. Volume: So how much does this bottle actually hold? 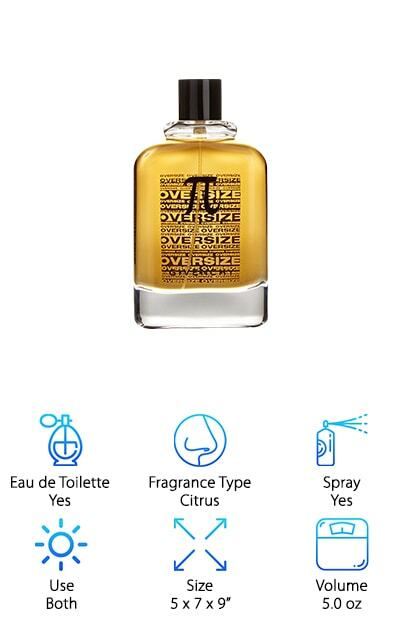 The size can sometimes be deceiving so make sure you know what you’re getting by checking out this icon before you buy your cologne. Now that you know what to look for, let’s find you the best smelling cologne in the world. We’ve put our top and budget picks at the beginning of the list, for those of you that are in a hurry to find something incredible and special. We’ve also included eight other picks for amazing and wonderful colognes if neither of those strikes your fancy. Be sure to check them all out so you get the one that is best for you. This spiffy looking cologne may be the best cologne ever. It has a wonderful fragrance that everyone seems to love. So not only does this smell amazing, it looks great doing it. 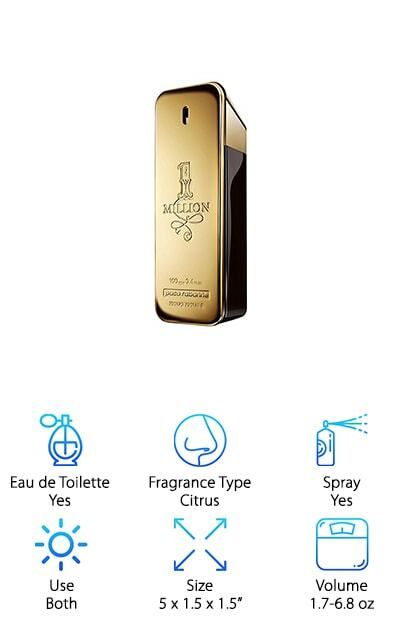 It comes in a sleek gold case that certainly lives up to it’s 1 million mark. This cologne is a great choice for anyone looking to emulate citrusy masculinity. It smells like fresh grapefruit, which is combined with a hint of mint and a striking dash of blood mandarin. 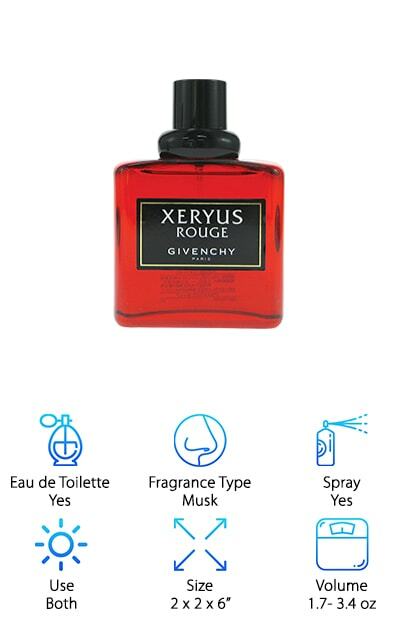 This makes it a bold and unique fragrance that is certainly striking. The middle notes combine rose, cinnamon, and spice for a little bit of warmth. This is all built on a base of leather, white wood, amber and Indonesian patchouli, creating a wonderful fragrance that is as striking to the nose as it is visually. This cologne is sure to please everyone. Plus it’ll look stellar on your nightstand. Our budget pick is a great choice for anyone looking for the best cheap cologne for men. This scent is a wonderful option for people who want something easy and beautiful to wear during the day. This cologne has a fresh, crisp and tangy citrus scent. It allows you to smell refreshed and crisp all day long. 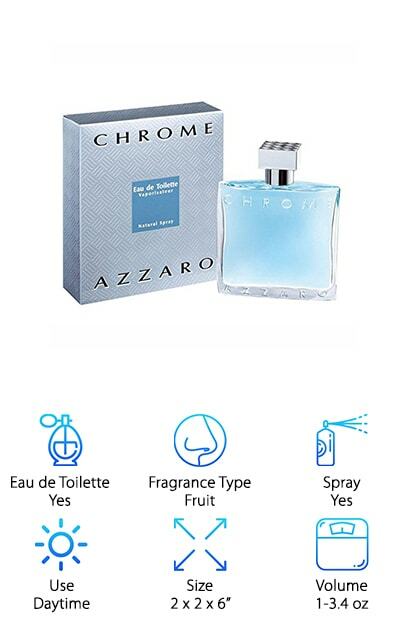 This scent is long lasting, so it’s perfect for people who want to spritz some on at the beginning of the day and end it still smelling fresh and clean. This scent is easy for anyone to wear comfortably and fits many different styles and personality types. It blends citrus, greens, and intense woods to achieve a scent that is unique but not overpowering. This is a great choice for anyone looking for a great and long-lasting daytime scent. It’s budget friendly for people who wear cologne every day and need something easy to wear and budget friendly. This is a great choice for people looking for a great scent with notes of honeydew and lavender. This unique scent combines pink pepper, honeydew, lavender, and pineapple leaf for a fruity sensation of modern fragrance. This fragrance is elegant and sophisticated, evoking a powerful scent. This is a great choice for someone looking for a great scent that can work both during the day and at night. Everyone seems to love how modern and refreshing this scent is. Jimmy Choo is sure to impress everyone within noses reach. The lavender is calming and soothing, while the honeydew provides a great blanket of light sweetness. This helps you to feel cool, calm, and collected throughout the day. It makes it easy to get through your day calmly and feeling fantastic. Pink pepper gives it a little bit of spice, making sure your scent is never boring. 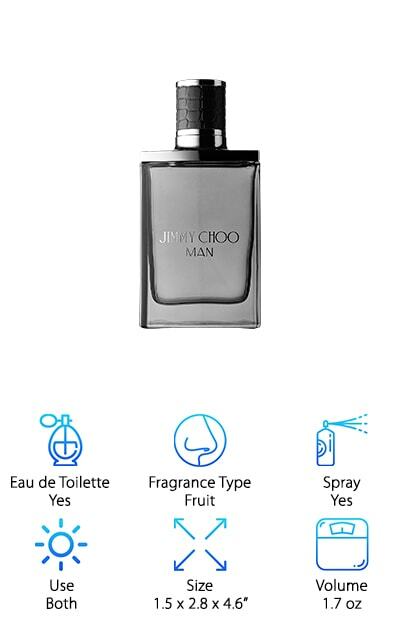 This Jimmy Choo Eau de Toilette is the perfect fragrance for anyone looking for a wonderful all around fragrance that helps you feel and smell amazing. This classic scent, introduced in 1996, is a strong contender for the best cologne for men. This refreshing fragrance has notes of green fruit to keep things fresh and just a little tart. Over that, there are notes of rich spices, transporting you to a lush and spice filled environment. This scent will last you all day, leaving you as fresh at the end of the day as the beginning. This scent is clean and bright, with just a hint of musk to keep things manly. This fragrance is for men who live life passionately and fully. The scent this cologne emits reminds those around you of passion and spice, leaving a lasting impression. This scent is refined without being boring, and an absolutely intoxicating fragrance. Add this to your daily routine to spice things up and keep it interesting. This scent is a classic for a reason to give it a try. 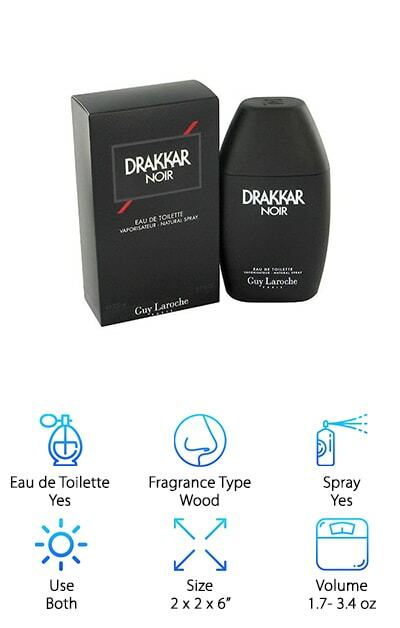 Any guide about the best smelling cologne for men would be incomplete without mentioning the ever famous Drakkar Noir. 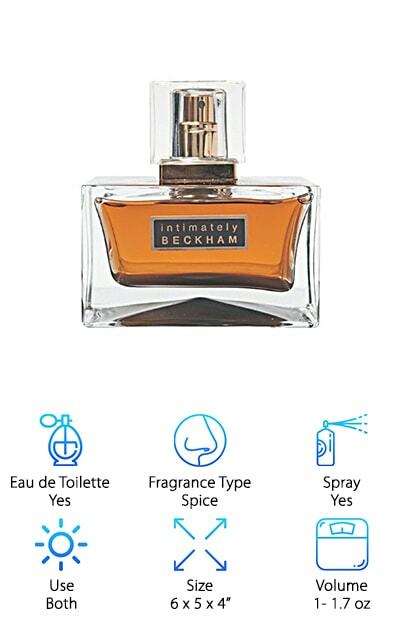 This fragrance is perfect for the self-assured man. It goes above and beyond, ensuring that your scent is perfect every day. This cologne is a rich and distinctive blend of tonic top notes, spicy heart notes, and a woody base. This unique combination ensures everyone around is delighted and intrigued as you walk by. To be more specific, the top notes contain traces of rosemary, artemisia, lavender, basil, lemon verbena, and bergamot. This incredible blend transports you to a fresh herb garden, sipping on a cup of tea. The heart notes are coriander, carnation, cinnamon, juniper, and jasmine, surrounding you in luscious spice and luxury. The base notes are leather, sandalwood, fir, amber, patchouli, oakmoss, and cedar. This roots the fragrance in manly woodiness, creating a scent that is both playful and earthy. This is a great aroma for anyone looking for something uniquely masculine and floral at the same time. This cologne can last for up to six hours, making it a great choice for a daytime scent that can be refreshed for a night out. 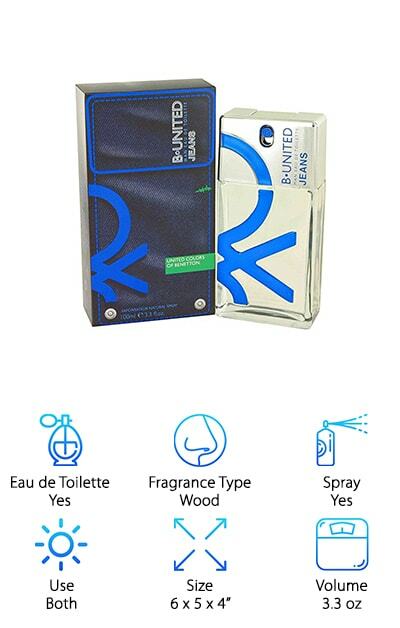 This scent is a perfect choice for both younger and older users, leaving something that is light enough for a young man and masculine enough for an adult. This scent is fresh on top, with notes of ivy, pink pepper, and mandarin orange. The top notes make it a sweet a juicy fragrance without being too feminine. The middle notes are jasmine and lily-of-the-valley, leaving a floral scent that conjures up images of freshly cut flowers. The base notes are sandalwood, amber, musk, vanilla, and cedar. This base roots the fragrance in masculinity and a deeper scent. The large size and small amount needed for application make it last a long time, making it a great gift for any young man. If you’re looking for men's best cologne, John Varvatos Artisan Eau de Toilette will not disappoint. This timeless masculine fragrance comes with an exotic and interesting twist. The straw casing looks wonderful, modern without being pretentious. This makes it a great choice for anyone looking for something that displays as great as it smells. This fragrance at its core reflects the art of craftsmanship and is an homage to artisans everywhere. It has a fresh citrus scent that is balanced with many different notes. On the top, it has tangelo, Sicilian clementine, Mexican winter mandarin oranges, wild thyme, marjoram from Spain, and Greek lavender. These notes create a beautiful bouquet of herbs and flowers. The middle notes are North African orange tree blossom, Indian Murraya, Nigerian ginger absolute, Chinese ginger roots, and purple ginger. This spicy middle brings depth and tang to the fragrance. The top notes are Georgywood, ambery belambre, kephalis, and serenolide. These notes root it in woodsy masculinity, creating a fragrance that is beautiful and unique. This incredible cologne is always among the best cologne for men review, because of it’s incredible scent and unique packaging. This cologne comes in a sleek all glass container that gives t n edge, even on your bathroom counter. The top notes of this fragrance are grapefruit, bergamot, and cardamom. 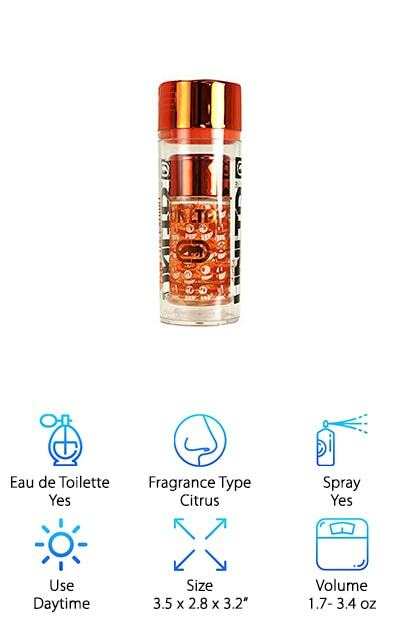 This gives the fragrance a freshness from the moment you put it on. The bergamot and cardamom give it a luxurious silky scent. The middle notes are nutmeg, violet, and star anise. These notes further that silky quality of the top. They also allow the wearer to sink deep into a spiced flowerbed every time they wear this beautiful fragrance. The base notes are sandalwood, amber, and patchouli. These notes root the fragrance in a familiar masculine scent that makes it easy to love. This fragrance is perfect for both daytime and nighttime use, allowing the user to smell amazing all day long. This is a great choice for people looking for a scent that is light and citrusy. This scent is not at all overpowering, as some men's fragrances can be. It instead leaves a light and fruity aroma, creating a pleasant and incredible atmosphere. Its unique packaging allows you to feel fresh and modern as you apply this wonderful fragrance. It has top notes of juicy and luminous bergamot. This is followed by a sweet wave of orange and fresh apple. The heart of this fragrance is a dewy melon. Also at the center, cardamom and lavender. These notes give the fragrance and earthy spice that sets it apart from simple citrus scents. The base of the fragrance is amber wood, vetiver, and musk. This creates a manly and earthy base, allowing the user to easily feel manly and positive throughout the day. The cheerful art on the outside greets you every time you reach to apply this incredible scent, putting you in a positive and happy mood. This incredible fragrance is fruity and floral, for a man who wants to smell fresh every time he walks out the door. This fragrance is classic and refined, a great choice for anyone looking for something that will never disappoint. It creates a scent that almost sparkles, bubbly and fruity. It blends fresh and light citrus with a strong woody aroma, creating the image of someone who has just come from a day in the forest gathering fruit. It has a low note of vanilla that gives it a little bit of sweetness. It stays on for a long time, making this a great scent to wear all day, and all night if need be. This cologne is a perfect scent for people who want something classic, refined and woody without being overly masculine. The fresh pop of citrus gives is a great scent for any user. It lasts all day, leaving you smelling just as fresh when you come home as you did when you left.